I wanted to do a double feature. Watch with these two just because both are pure fun entertainment. Laugh out good time entertainment. I have seen these two so many times and yet it never gets old watching them. What is awesome and amazing this time around is that I got to experience both on a wonderful and flawless Blu-ray that are crisp in imagery and solid in sound quality. Twilight Time always amazes me with the quality they put into their products. Every time I review a Twilight Time Blu-ray it’s like I am repeating myself, and it is the truth. I repeat the excellence that are the product. I am always amazed at the quality put into the transfer to 1080p High Definition Blu-rays. Both films have never looked any better. 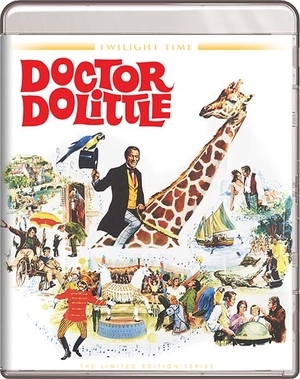 I was super excited to hear about Doctor Dolittle coming to Blu-ray. I am a huge fan of the movie. It’s one of the films I grew up with and enjoy repeatedly watching as a child. It has such a phenomenal cast of actors. Starring the one and only master of performance, a personal favorite of mine Rex Harrison. Harrison is a God and a truly important movie performer. Also starring the master thespian Richard Attenborough who needs no introduction. He captures his many roles with a flawless mastery that must be seen to be fully understood throughout his career. His performance in 10 Rillington Place is masterly. There is so many wonderful actors and actresses in Doctor Dolittle. Doctor Dolittle is just a fun film for the whole family and never gets old. Doctor Dolittle is directed by one of the all-time greats of cinema, Richard Fleischer. Richard was a total genius when it came to memorable pieces of film. He directed so many greats of the cinema world. All one has to do is look at his film list, the Disney classic 20,000 Leagues Under the Sea, 1970’s Tora! Tora! Tora! He also directed three true life Serial Killer films that I consider some of the best films of all time, 1959’s Compulsion, 1971’s 10th Rillington Place and one of my personal favorites 1968’s The Boston Strangler. Which might I add that 10th Rillington Place and The Boston Stranger have both been released on Special Edition Twilight Time Bluray's and my reviews can be read in the Twilight Time Section. Directing such sci-fi classic’s like 1966’s Fantastic Voyage, and 1973’s Soylent Green. He was a director that had a lot of hits and some misses. No matter how small, or great a film was, he mastered it with a flawless ease of filmed perfection, and in my viewpoint his film 10 Rillington Place is a prime example of that perfection and Twilight Time has honored that film with a 3,000 Unit Special Edition Blu-ray. It was great seeing Doctor Dolittle also being honored with a Special Edition Blu-ray. I don’t know how anyone can't love Doctor Dolittle. It’s just a prime example of a fun family film. 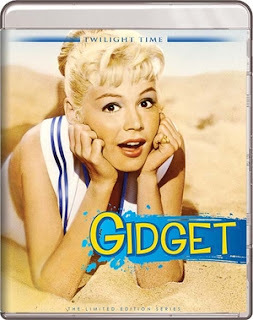 Next up is an equally fun family film 1957's Gidget. Gidget has a wonderful cast of performers also. The master talent of Arthur O’Connell. A massive character actor, starring in some of the greats, such as the masterpiece, 1959’s Anatomy of a Murder. The wild and fun action comedy adventure, 1965’s The Great Race. The wonderful science fiction, 1966’s Fantastic Voyage. The great family comedy, 1967’s The Reluctant Astronaut. The horror cult classic, 1972’s Ben. The wonderful special effect action adventure, 1972’s The Poseidon Adventure, you get my point. He starred in many wonderful films from television and feature film. He is one of those performers that always stood out, no matter how small the part is. He was the very definition of acting. He also was honored with two other Twilight Time film special edition releases, April Love and Huckleberry Finn which both of my reviews for them can be read in the Twilight Time section.. Starring the one and only Sandra Dee. Her name is famous, her face is beautiful, vibrant and most of all golden in cinema history. She only starred in a little over 30 performances but she left a lasting impression on Hollywood both great and small. From motion picture to TV she shinned and gave the world memorable performances. Just a beautiful, awesome and dynamic performer. She is greatly missed. She was a golden ticket of acting perfection. Gidget stars the one and only Doug McClure. Over 100 credits under his name. He was a solid actor that shined in countless pieces of cinema from TV to motion picture. Probably best know for his long running character of Trampas in the western TV series The Virginian that ran from 1962 to 1971. I personally remember him in so many wonderful Drive-In Late-night B-grade films that I love so dear. If you know me I am a B-movie Low Budget film lover. I love Cult films, Late night Drive-In films. Such greats like 1974’s The Land That Time Forgot, 1976’s At the Earth’s Core, 1977’s The People That Time Forgot, 1978’s Warlords of the Deep, 1980’s Humanoids from the Deep, and so many other wonderful B-movie greats. Wonderful seeing him in Gidget again. Gidget is a fun surf comedy. It’s about a young girl named Francie Lawrence a.k.a. Gidget. She is 17 years old and the time is summer break. All her girlfriends are seeking out boys. Her parents even try to set her up on a date. She wishes for the time where boys didn’t matter. She is a tomboy. One day going to the beach she meets Moondoggie a surfer. She quickly becomes infatuated. He returns no romantic reality toward her. Frances a.k.a. Gidget loves the reality of surfing. There she buys a used surfboard with her parents’ permission. She quickly heads to the beach where her friends name her Gidget, meaning girl and midget. She starts hanging with an all-male surf gang. Basically, beach bums. From tanned bodies to Luau parties and moments of countless surfing. This comical film is a wonderful film for the entire family and to re-enter a golden time of Beach Surfing films that became all the craze back in the day. Gidget was directed by prolific director Paul Wendkos. Directing over 100 movies and TV features in his long career. He directed many True Crime features such as Joe McGinnis Blind Faith (1990) about Robert Oakley Marshall who in 1984 was charged with the contract killing of his wife. Cross of Fire (1989) about the 1920s' Ku Klux Klan leader D.C. Stephenson. The Taking of Flight 847: The Uli Derickson Story (1988). The Ordeal of Patty Hearst (1979). Honor Thy Father (1973) which is about the rise and fall of the Bonanno organized crime family. He also directed one of my personal all-time favorite TV films The Legend of Lizzie Borden starring the one and only Elizabeth Montgomery in one her most shocking roles. He also directed one of my favorite fictional TV movies The Execution (1985), about 3 women who find out a local man is a Nazi War Criminal and go about with a scheme to kill him. He is probably best known for directing the movie Gidget and two of its sequels. Both movies look amazing for their age. The audio is equally impressive. The sounds are crisp and the imagery is vibrant and looks like a perfect transfer to, two older films. Yet again another flawless example of how to treat a film. I tend to sound like I am a broken repeating record when it comes to reviewing the audio and video of Twilight Time Blu-ray’s but, it’s always a true treat to see the amazing transfers. Isolated Score Track. Three persons are involved with the music. Alexander Courage, Leslie Bricusse did the song score and the main stand out musician Lionel Newman. Now both Lionel Newman and Alexander Courage composed the music. Lionel Newman was an amazing composer and conductor of music. Newman was a brilliant, music genera master, in his own reality. Gifted in the art-form of supplying memorable music scores and tunes for many wonderful films, and for TV shows that most will remember for its music. First movie for me that really comes to mind, would be the horror classic, The Omen, followed equally by the Sci-fi Masterpiece Alien. I mean just looking at the scores he has conducted, The Omen which is one of the greatest and always spooks me anytime I hear it, showcases his amazement. He was the uncle to music man, Randy Newman. He won an Oscar for the amazing 1968 Hello Dolly. He was the music supervisor for Star Wars, The Empire Strikes Back, and Return of the Jedi. That should tell you his mastery. 11 Academy Award nominations and 1 win. He crafted his art-form over decades upon decades. He crafted composing music and soundtracks all the way back into the start of the 1930’s. He mastered his talent through both small and large, from the TV series Mash, to The Green Hornet and music supervisor on Land of the Giants, Lost in Space, Batman, and Planet of the Apes. He also was the conductor for three other Twilight Time release’s: The St. Valentine’s Day Massacre, The Boston Strangler and Flaming Star starring Elvis Presley. Audio Commentary with Songwriter/Screenwriter Leslie Bricusse and Film Music Historian Mike Matessino. A Wonderful listen always is a treat to listen to historians and those involved in film. Isolated Music Track: The music is done by really a musical genius. A music guru in a sense. A music god that worked on so many countless films. His music is still being used today in cinema, at least his last music was used on the movie soundtrack to Casino (1995). He passed away in 1980 but left a vast array of music. There is close to 500 credits in the music department under his name. Starting in 1927 went all the way to 1967. 500 credits in that short of time is mind blowing. His work on so many important pieces of cinema including just to name a few: 1927’s masterpiece The Jazz Singer. 1939’s The Man They Could Not Hang, 1939’s Mr. Smith’s Goes to Washington. A real true personal favorite of my the one and only masterpiece 1940’s His Girl Friday. 1953’s magical The 5,000 Fingers of Dr T. 1953’s From Here to Eternity. 1953’s Miss Sadie Thompson. 1956’s The Eddy Duchin Story which might I add was honored with a Twilight Time Blu-ray also. The amazing 3:10 to Yuma, and so many countless others. Two more awesome, fantastic releases by the wonderful company that honors, cares for, and respects cinema as important art, that should be expressed in top notch products. Twilight Time Blu-rays, always seem to amaze me in their products. Both Doctor Dolittle and Gidget are those prime examples of perfection in transfer and sound quality. Both have dynamic picture quality. Two priceless transfers that should be seen to be fully appreciated. Doctor Dolittle and Gidget are excellent comedy films. Both Blu-ray's are Highly recommended. Would have loved to seen more special features on Gidget but still totally satisfied with the transfer to 1080p High Definition.